It’s all about maneuvering and knowing when to turn and when to hold your course. There are interesting gameplay twists thrown in, such as changing Skins and holding down the mouse button for quick speed boosts. Type in your desired nickname in the field provided and press “Play”. You’ll be taken to a field and control a snake via the mouse. Move the mouse to an area and your snake will follow the pointer. There are colorful dots that you can eat to become longer. As you navigate the course you’ll inevitably run into snakes of different lengths. Press and hold the left mouse button to gain a quick speed boost, which you can use several times during the course of the game. Quickly move your snake’s head out of the way when you see an incoming snake and try to get their heads to bump into your body. If you’re successful, the snake will disappear and turn into colorful dots that you can eat to become longer. If you’re a beginner at this type of game, then it’s in your best interest to practice and invest some time in to become better. This improves your reflexes and reaction time, which can mean the difference between victory and defeat. As you play, you’ll soon learn how to swerve from incoming snakes and turn in a way that it will be difficult for them to move out. Your snake moves where your mouse points, so don’t be totally immersed and remember to quickly navigate to get the higher ground. If online is too difficult, you can practice a few rounds with AI opponents to get a feel on how Slither.io works. Speed Boost is a nifty in-game feature in Slither.io that makes things more interesting. There are several ways on how you can incorporate boosting in your tactics, both in early game and as you try to climb the Leader-board. Use boosts whenever you see dots that are in a straight line to eat them and become longer faster. When fighting against other snakes, use boost to get ahead and to try and trap them first. Remember, it’s all about reflexes and in using your length to trap your opponents and have them run head-first into your wall. 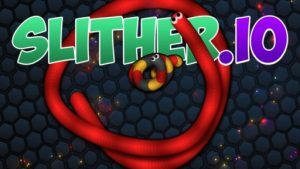 Your goal in Slither.io should be to improve each time you hit the “Play” button. The game lets you see the final length before you ran into a wall, so try to beat your personal length on the next round. You can get a glimpse of how the top players in the Leader-board position their snakes to beat their opponents as you play; emulate their methods and come up with a strategy that you can call your own.